When we finally came into New Braunfels I felt quite wretched. It was a hot day, the appearance of us after nine days of camping out on the road is hard to describe. The first thing we did was to go to Bracht’s who had offered to find a house for us. Not one was to be found in New Braunfels with more than one room and besides all these had no rainproof roofs. We were recommended to a residence in Comaltown, a 15-minute drive from New Braunfels, and this we decided to take. We first ate our noon meal at a boarding house and then drove out to what has now been our sanctuary for three weeks. That was a road to drive on. Six oxen were hitched to the wagon and two times we had to shudder and quake through water, Comal Creek and Comal River, and then on over rocks, sticks and stumps. To travel on the roads here one must acquire nerves of steel. Here in Comaltown our home consists of four rooms, some think quite out of the ordinary here, only it was occupied before it was finished, as usually is the case here and so was never completed. One room has been whitewashed and you cannot understand what that means here, but the rest stand in their (unplastered) raw brick walls. Only one door has been put in, all the rest are boarded up and three rooms have no ceiling, only the bare roof, and several broken window panes, so on nights when a norther is blowing we have to use a lantern for light (Lighted kerosene oil lamps or candles naturally would be blown out by the wind). Everybody marvels at our wonderful home, which even has a cooking machine (Kochmachine). The house also has a beautiful porch (Gallerie) and there have not been more than three days on which we had to stay inside the house; the other days it was much pleasanter out on the porch. So, here we now run our little household, Antonie and I change duties each week, one does the kitchen work, the other takes care of the children and tidies the bedrooms. The boys have to keep their own room in order, chop stove wood, and carry it and water into the house, get provisions from town, tend to the horse and mule we bought here in Comaltown. After that they go exploring and bird hunting and engage in other profitless undertakings. The water of the Comal River is the most wonderful seen anywhere. Its entire course is but a few miles long but is wider and flows much more water than the Ruhr River at Arnserg. It is a really enchanting, (bezaubernd) stream. Forests, called bottoms (like pecan bottom), extend along all water courses. Otherwise Texas is not much wooded, which facilitates putting land into cultivation. Up to now I have seen but few varieties of trees, no southern vegetation whatsoever, several species of oaks. The live oak is an evergreen and has a very hard wood so it is not used much. Cactus and yuccas, which we consider deep southern vegetation, grow here in wild profusion. Hedwig today found a beautiful light lavender flower with fragrance so much like a violet. Maybe it’s just me, but the thought of traveling in a wagon… in December…and wrangling five kids would cause me to stop and think a long while before deciding on this undertaking. The adventure might sound fun for maybe a day before it would get old. And it makes me shudder just to think about what it would be like with only a roof, no ceiling, much less missing window panes. That does not sound like much more than camping in a shelter. Brrr! I’m proud my ancestors and people like the Kapps toughed it out to make a new life for us, but I am not so sure that I would be very good at it. I’m only glad that the housing available today is a tremendous upgrade from 1850. 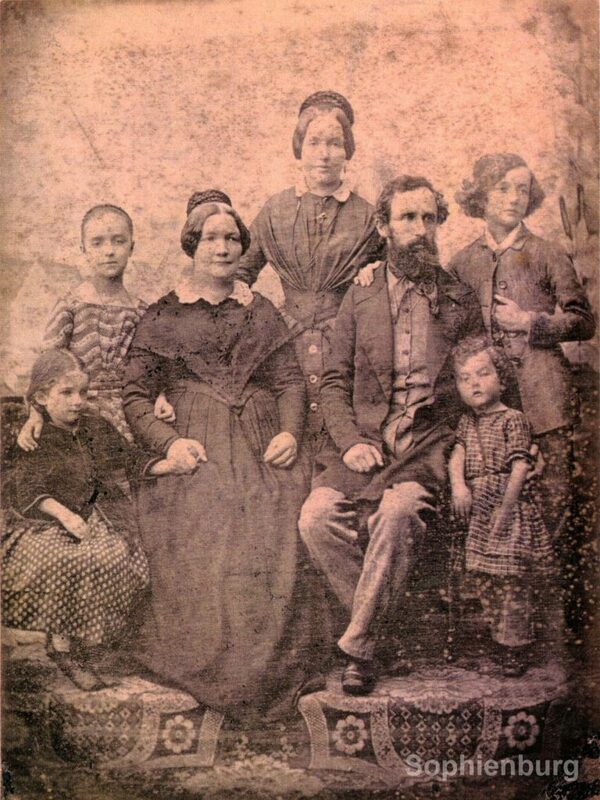 The Ernst Kapp family circa 1849. Front row L-R: Hedwig, Mrs. Ida Kapp, Dr. Ernst Kapp, Wofgang. Back row: Julie, Antonie, Alfred.